After the successful two seasons of Narcos, the third season of the hit crime drama was released in September 2017. Season two’s breathtaking finale saw our iconic character Pablo Escobar killed during a tense rooftop shootout. With the king of cocaine dead, there was a big challenge to overcome: continue the hype well into the third season without Escobar and present the new cartel that took his place: the cartel of Cali. 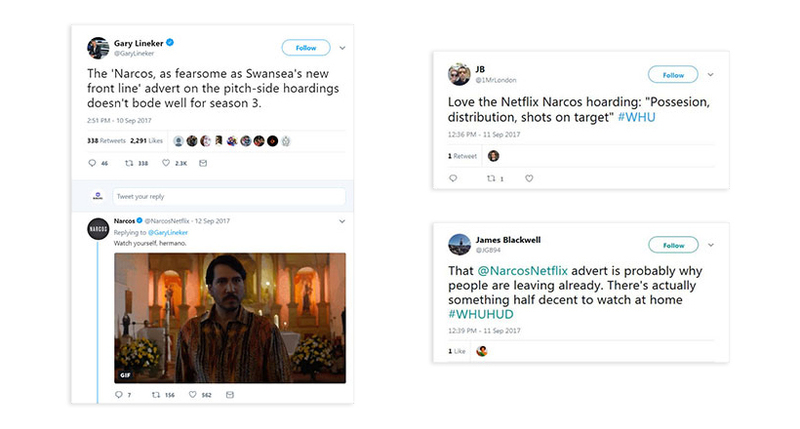 For this reason, Biborg played on this challenge by highlighting how Narcos was the series that turned viewers addicted. This idea was reinforced through quotes from magazines that played on this double sense of "addicted to the series" / "addicted to drugs". The concept was relayed through an online display campaign including homepage takeover formats across 7 French sites, YouTube trueview and YouTube bumper ads for France and German territories as well as out of home formats which were displayed around France. And one generic line - Possession. Distribution. Shots on target. Reactions were powerful, starting with Gary Lineker himself (ex International footballer), see his tweet here. Bouncing off current football related news, a print campaign of contextualised messages were displayed on the front cover of the French sports magazine, L’Equipe. 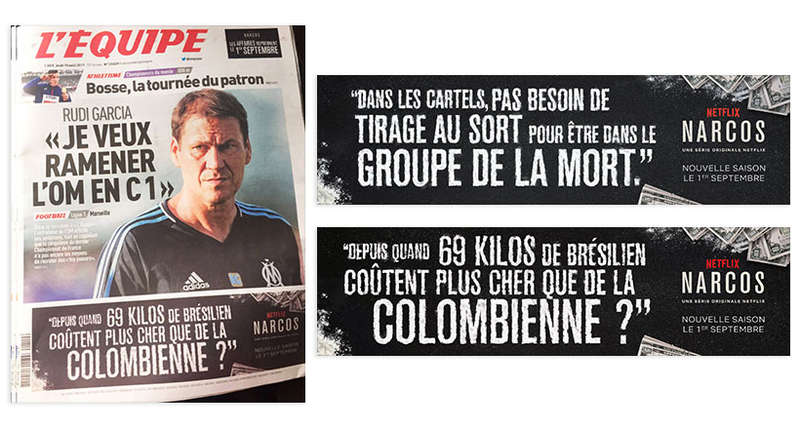 On August 10, a punchline which could have easily come out of Pablo Escobar’s mouth was diffused: “Depuis quand 69 kilos de Brésilien coûtent plus cher que de la colombienne?” (Since when did 69 Brazilian kilos cost more than Colombien kilos), a sentence alluding to the 222 million euros spent by the Paris Saint-Germain Football Club (PSG) to transfer the Brazilian footballer Neymar from the FC Barcelona team to their club. At the same time the phrase cleverly refers to the price of a kilo of cocaine from Colombia. Find out more on Oh My Goal (FR).